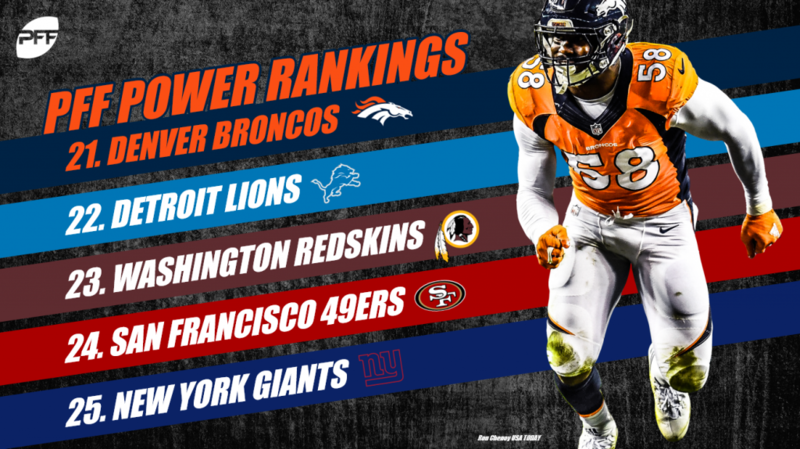 Week 16 brought some excitement, with three of the top five teams in our power rankings losing outright last week, leaving a Week 17 slate that is certainly more compelling than last year’s. The Saints secured home-field advantage in the NFC playoffs Sunday with a hard-fought win against a game Pittsburgh team. They are currently the favorite to win the Super Bowl (as they have been for weeks), ringing in at roughly 32 percent (+215). While it hasn’t been pretty the last few weeks, the Chiefs are still a pretty solid bet to come out of Week 17 with the one seed in the AFC, only needing to beat Oakland at home to secure said spot. With a 17.1 percent chance to win the Super Bowl (+485), they still represent the second-most-likely team to hoist the Lombardi Trophy in what has been an MVP season for Patrick Mahomes by our WAR metric. “Running Backs Don’t Matter” took a big W last week when 2017 1,000-yard-rusher-turned-street-free-agent C.J. Anderson was brilliant, gaining 128 yards after contact en route to a 31-9 win over future number one overall pick holder in Arizona. They look locked and loaded for the No. 2 seed in the NFC (87.8 percent). While the Patriots have not been inspiring for the better part of a month, they have a pretty clear path to their third-consecutive Super Bowl appearance, with Kansas City having failed to win a home playoff game since 1993 and the Patriots currently with an 83 percent chance to secure a first-round bye. This is the highest we’ve had the Bears since the inception of the PFFELO rating system, and while we’re not yet sold on Mitchell Trubisky and his 4.36 rate of turnover-worthy plays (versus a 3.37 big-time throw rate). It will be interesting to see if they play through Week 17 against the Minnesota Vikings, as a win would likely eliminate their division rival (and 2017 NFC Championship Game participant) from the playoffs. 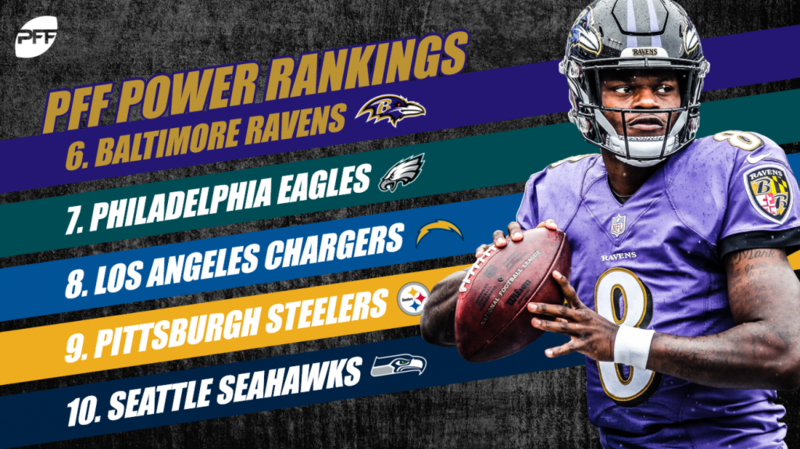 This is the Ravens’ highest mark of the season, and despite this, they need to beat the upstart Browns in Week 17 to win the AFC North and make the playoffs for the first time since 2014. At a roughly 70 percent chance, we like the Ravens to accomplish their initial goal of a division title, something that looked like a long shot at 4-5 and with a rookie quarterback starting. We give the Eagles roughly a 30 percent chance to make the playoffs a year after winning the Super Bowl. If they do get to the dance, it will be fun to see whether they go back to Carson Wentz or stick with Nick Foles, who was 7-of-9 for 174 yards between 10 and 19 yards against the Houston Texans’ defense last week. When the story of the 2018 season is written for the Los Angeles Chargers, late-season home losses to the Denver Broncos and the Baltimore Ravens will be the subject of much regret for the Bolts. Likely without the aide of home-field advantage (just a 12 percent chance going into Week 17), we have what is one of the most talented rosters in the NFL with an MVP candidate at quarterback with only a four percent chance to capture the Lombardi Trophy, having to likely go on the road numerous times in the process. Much like the Chargers, the Steelers are likely going to look at late-season losses to the Broncos and the Raiders with their fair share of regret, now needing their rival Browns to win a game in Baltimore for even a chance at their third consecutive division title. While JuJu Smith-Schuster went to Twitter to take the blame, his 2.11 yards per route run are a top-12 mark among wide receivers and represent a budding superstar in the making for Pittsburgh. As our colleague George Chahrouri said on the last PFF Forecast, the only thing keeping Russell Wilson from being the MVP is volume, as he is only 20th in total pass attempts despite starting every game. Despite this, he’s been worth over four-and-a-half wins above replacement through the season’s first 16 weeks. He makes Seattle one of the scariest dark horses in the NFL playoffs this coming January. The Titans play some of the ugliest, unwatchable games every single week but have managed to win enough (nine) of them to put them in a better-than-even-money chance to make the playoffs – with a date on Sunday Night Football with the Colts upcoming. Even if Marcus Mariota plays, he’ll have to be more effective than he’s been during this injury-plagued season to have success against an upstart Colts defense since his clean-pocket passer rating of 97.5 is just 21st among qualifying quarterbacks in the NFL. Despite the shaky play of Dak Prescott and the fleeting value of a run-first approach to offense, Dallas has been very good defensively for most of the season, especially against the run (-0.21 EPA allowed on early-down passes). Their sneaky issue with early-down passing (+0.06 EPA allowed on a 51.8 percent success rate) might come back to bite them against more efficient offenses that avoid third down and longs altogether in the playoffs, however. A 2017 NFC Championship participant, the 2018 Vikings have had to grind their way into a position to win a game and make the playoffs. Their poor running game (less than 35 percent early-down success rate) and the inefficiencies of quarterback Kirk Cousins (+0.0 EPA on all passes) have tripped them up at times. However, having Adam Thielen (2.06 WAR) and Stefon Diggs (1.01) means that a turnaround for their offense can certainly be in the cards, making them a compelling underdog moving forward. The paper-champion nature of the Houston Texans has been revealed a bit the last month or so, with losses to the Colts and the Eagles halting what was one of the better streaks we’ve seen in the NFL in some time. Deshaun Watson (3.50 WAR) and DeAndre Hopkins (2.65) make up for significant issues up front and in the secondary for the Texans and will likely be enough to stave off a good Jacksonville defense en route to their third division title in four years Sunday. Andrew Luck is a top-five candidate for MVP via our WAR metric, generating +0.15 EPA per pass attempt while earning a positive grade on almost 28 percent of said attempts. 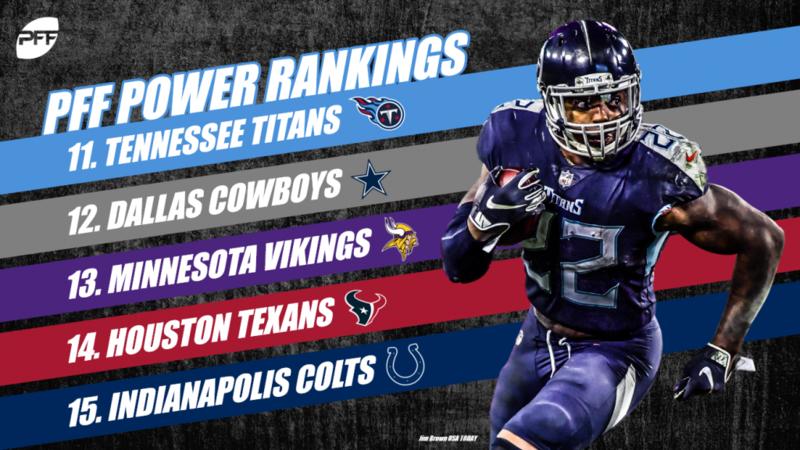 If their defense can continue to play well (only +0.05 EPA allowed on early-down passes and -0.15 on early-down runs), there’s a significant chance that they can win in Tennessee Sunday night and fulfill their destiny as a team we’ve touted as being a dark horse for the better part of the season. 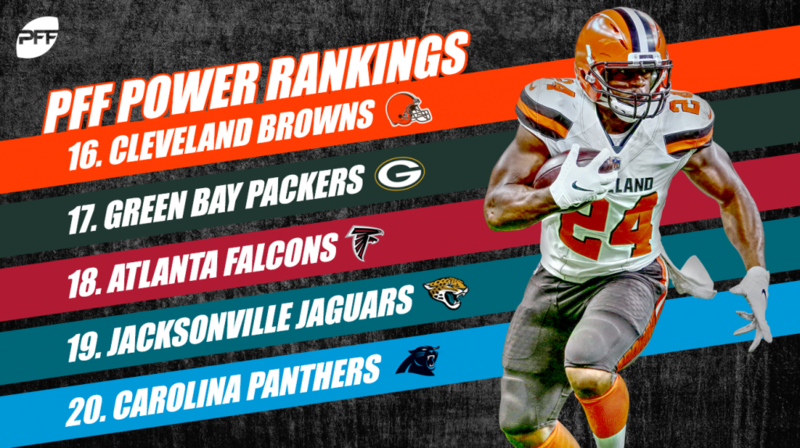 The Browns top-four players in WAR are Baker Mayfield, Myles Garrett, Jabrill Peppers and Denzel Ward, four of their five first-round picks from the last two drafts. This is a great testament to what the Browns are building and how they are building it, passing the ball and stopping the pass. They have an opportunity to finish above 0.500 for the first time since 2007 Sunday, in a remarkably winnable game to keep the old Browns out of the playoffs. The Pack Door was finally open for the Packers (-3), who came back from multiple touchdowns multiple times to beat the Jets on the road and avoid an 0-8 road finish on the season. Davante Adams has been their second-most valuable player this season with respect to our WAR metric, turning 162 targets into 111 catches, 477 yards after the catch, nine missed tackles forced and 13 touchdowns. One more week of watching Falcons football couldn’t come fast enough. 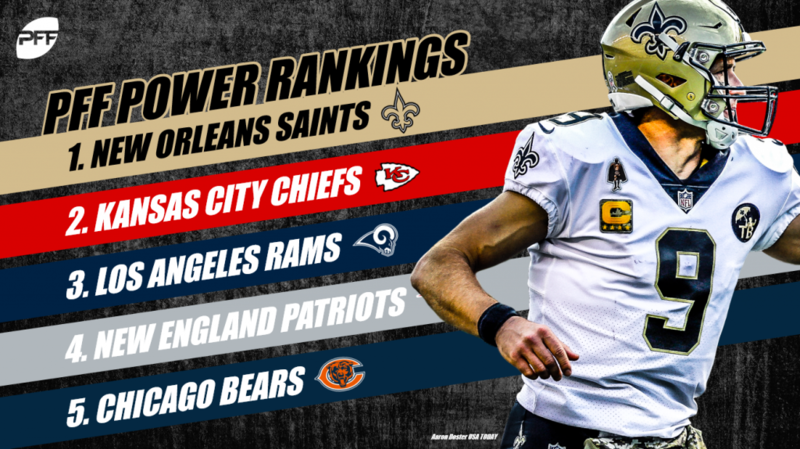 As they try to get to 7-9 on the road in Tampa, it will be tough not to think about what could have been if they could have just pulled off close home games against the Saints, Bengals and Cowboys. Their defense has been poor against the run on early downs (allowing +0.0 EPA on said plays), but most of their issues have been on third down. If they can get healthy defensively and shore up things on the edges offensively, 2019 could be a rebound year for the Birds. Jacksonville came up big for us last week in Miami, winning outright by double digits despite punting on a red-zone trip after a fumble recovery. They have a chance to keep the Texans from taking their division title on Sunday in a game that opened at about HOU (-8.5) but has taken significant money to HOU (-7), a number for which we would still like the Jaguars. Buckle up! Not to beat a dead horse, but the Panthers were at one point 6-2 before dropping seven (maybe eight) straight to cash the under on their season win total. Christian McCaffrey shines as the prototypical next generation running back. His pass catching capabilities reflect a rare occurrence where the running back (McCaffrey – 1.38 WAR) has a higher value-add than the quarterback (Cam Newton – 1.03 WAR). Feels pretty close to rock bottom for the Broncos dropping a Monday Night Football game to the Oakland Raiders. Case Keenum may be on his way out of town, as he has been unable to replicate the downfield passing game he flashed in 2017. Comparing 2017 to 2018 Keenum’s deep passer rating of 66.3 is 25 points worse than 2017 at 91.7. Obviously, the deep passing success isn’t entirely reflective of Keenum’s ability as much as the significant drop off he has experienced at wide receiver. The Lions failed to cover after allowing the hail mary to Kyle Rudolph to finish the first half. Matthew Stafford is the 15th-most valuable quarterback according to our WAR metric. Coming in middle of the pack feels indicative of his career. Stafford has not performed since the Lions traded away Golden Tate, which could reflect that people in this organization are not on the same page. Things should come unhinged next season if no one is let go this offseason. The Redskins were officially eliminated from playoff contention with their loss to the Titans on Saturday night. Adrian Peterson appears to be something of an ageless generational wonder at running back. In 2018, he has averaged 3.03 yards after contact this season, which is above his career average and the best mark he has had since his glory days with the Vikings in 2012. The 49ers continue to play well wrapping up their injury-plagued 2018 season. Nick Mullens could be securing a big payoff as he continues to look good from a clean pocket, posting a passer rating of 108.4. He is 15th in EPA generated per dropback at .08 with the 49ers having a successful early down pass attempt on over 51% of attempts. The only reason they lost to the playoff-bound Bears was their inability to finish drives with touchdowns. Eli Manning and the Giants gave the Colts everything they could handle on Sunday before eventually falling 28-27. What some may consider a career resurgence, Manning has benefited from the highest average yards after catch per attempt of his PFF Era career. With an EPA generated per dropback of -.01, the question soon becomes how good could Saquon Barkley be with a competent quarterback? 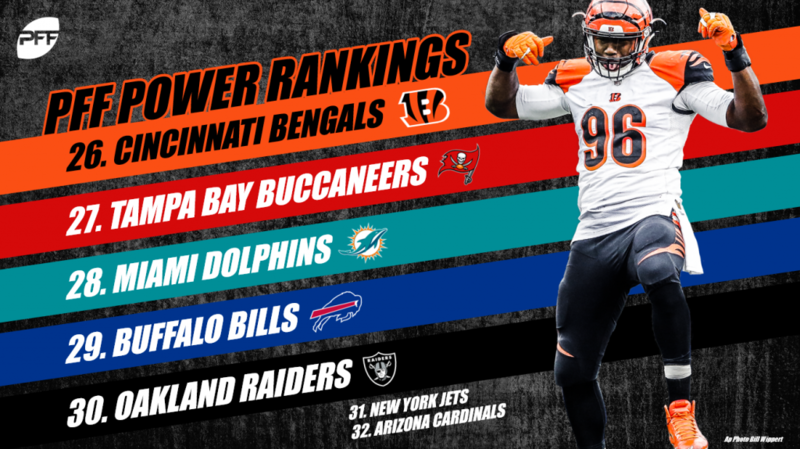 The Bengals are poised for a smooth transition to Hue Jackson-led futility as they wrap up their injury-plagued 2018 season. From an EPA and grade per target perspective, Tyler Boyd has been one the best receivers in the NFL in 2018. The framework is in place for this team to return to the playoffs, it would be a mistake to hand that gift over to Hue this offseason. The Buccaneers definitely have a decision to make this offseason related to their direction with Jameis Winston. He continues to put up solid numbers but hasn’t had those stats translate into wins. On one hand, Winston has the second-highest turnover-worthy play percentage among starting quarterbacks. He has also generated an EPA per dropback of .11, which is in line with what Tom Brady and Aaron Rodgers have generated in 2018. He is the definition of a boom-or-bust quarterback, but his upside is still intriguing and will find a home if not on the Bucs in 2019. The Dolphins were officially eliminated from the playoffs with their 17-7 loss to the Jaguars. At 7-8, the Dolphins are by far the lowest PFFELO ranked team that will finish as an average team according to win total. Ryan Tannehill has been incredibly poor in his return and has the highest turnover-worthy play percentage in the NFL. Compounding his turnovers is his inability to generate big-time throws at a miniscule 2.8% of attempts. Josh Allen is currently tied with Aaron Rodgers for the ninth-highest big-time throw rate in the NFL. Along with his rushing ability, the upside is definitely present for Allen to turn into a top-end NFL quarterback. His development limiting downfield turnover-worthy plays will go a long ways towards determining if he develops into what his upside offers. The Bills will be a trendy rebound candidate in 2019 with their defensive capabilities and people buying into another step forward for Allen. While it took all the way until Christmas, the Raiders got their fourth win of the season Monday against the Broncos, leveraging a special teams unit that has come on strong of late with Daniel Carlson and the great Dwayne Harris. While Derek Carr continued to be a third-tier, cluster four quarterback (generating only 6.2 yards per clean-pocket pass attempt), when the rest of the team plays well against a weak opponent (as it did in 2016), things can go well for Oakland. We’re onto Week 17 and a big game for the Chiefs in Arrowhead! Sam Darnold has been one of the league’s best quarterbacks the last three weeks, posting the third-best clean-pocket passer rating (126.5) among his peers during that stretch. They’ve played the third-easiest schedule this season (only the Colts and Bears have had easier). Unlike the Colts and the Bears, close losses will keep the Jets out of contention for the third-straight year and likely will result in changes moving forward for a team lacking some draft capital as a result of the Darnold trade. Going into the season, our model had the Cardinals projected with over seven wins. A lot of this had to do with their talent defensively and a few season’s worth of decent data from quarterback Sam Bradford ahead of a talented rookie in Josh Rosen. Welp. Both quarterbacks were below replacement level, and the defense struggled with adjusting previous players to a new scheme. With the number one overall pick a likely asset for them this offseason and a few teams in need of the (few) possible franchise quarterbacks, the impetus is on the Cardinals to turn that pick into a collection of players they can win with moving forward.